Home Profile Directory Danilo León, Ph.D.
Dr. León received a Masters in Language Teaching-Spanish and a Ph.D. in Spanish Literature from the University of Missouri-Columbia. His areas of specialization include contemporary Peninsular Spanish literature and cultural analysis. 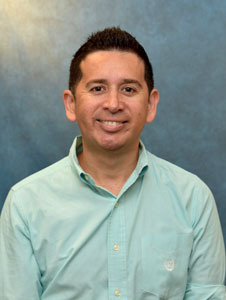 His teaching experience includes courses in Spanish language, literature, composition, conversation, Spanish for professional purposes, cultural and gender studies, and film. His articles and dissertation focus on the ways in which factors such as race and gender shape the experience of immigrants in Contemporary Spain. He loves talking about his research and any other topics in the Spanish-speaking world.